They are all good sauces… but no pictures! 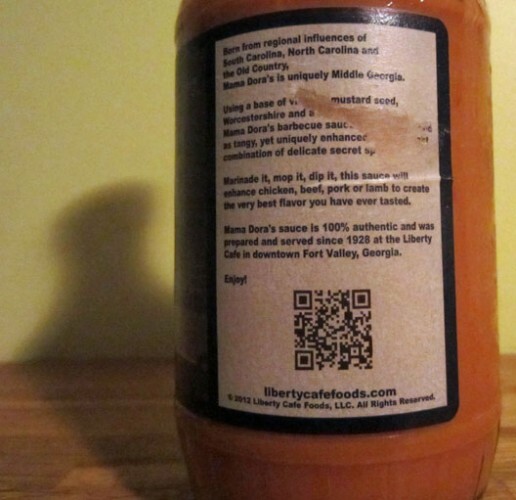 I think when you name a sauce or a product after a person, people want to see that person represented. Anything. A picture or a cartoon or a stick figure will do! Let’s say you name your sauce Wild and Crazy Hawk. What are you going to do. All white label with a black and white font? Or maybe a picture of a pig? No. You might match that up with a picture or a cartoon or a drawing of a wild and crazy hawk (I have no idea what that would look like by the way). End rant. 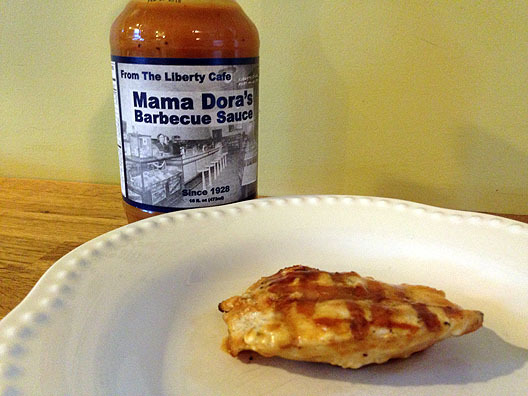 So here’s what Mama Dora Barbecue Sauce did right!! They have a picture of Mama Dora – hooray!! And they have a rich history. 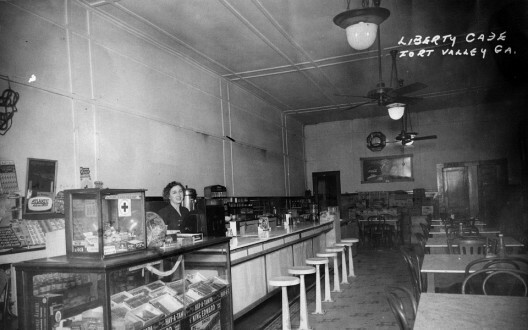 They have been serving it – or something like it – from 1928 to 1965 at the Liberty Cafe in Fort Valley Georgia (now closed). The problem is that the picture – while original and historically accurate – doesn’t give us a quick shot of Mama Dora. I could suggest a few minor touch-ups, however. An amazing picture for sure! While maybe all they really need to do is put a big picture somewhere on the label like this. This is a great tasting mustard sauce. 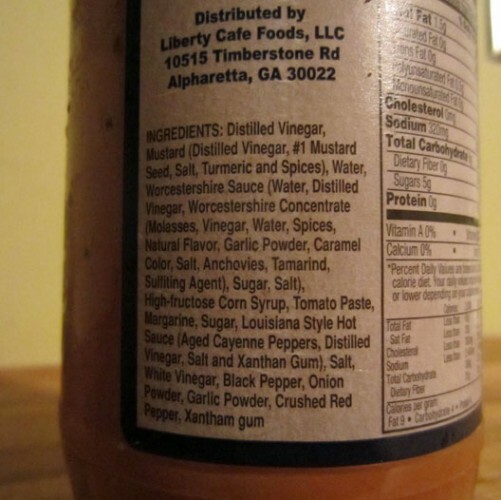 It has a deep rich flavor provided by a combination of mustard, Worcestershire sauce, Louisiana-style hot sauce, and various other spices like garlic, onion, and crushed pepper – which you can see from outside the bottle floating around the dark yellow/brown base. The sauce flows a bit thin but holds well to meat products. The sugar and carbs count is lower than traditional BBQ sauces for you Atkins, South Beach, Paleo, carb-avoiding diet types although it does add high fructose corn syrup for those of you who want to know. Did I mention it tastes great. Not only does it have the vinegary tang flavor that I like in a mustard BBQ sauce, it’s also got a trace of heat and and it’s not so sweet – unlike some mustard sauces that taste a bit too much like honey-mustard salad dressing. Eww. The extra complexity from the Worcestershire sauce also kicks this to a new dimension giving you a little extra savory tart kick – what some foodie refer to as umami. I couldn’t stop eating it once I had a small taste. I went back and forth on this one and it was so close. While I’d love a label touchup and to see it be a little thicker and have no HFCS, it was simply too tasty to give it anything other than a 5 star rating. Way to go, Mama! Check out the links for more information. I love a good mustard based sauce too. And like you, I don’t care for the honey-mustard salad dressing styles out there either. Love the label and packaging on this one. Thanks for the review. 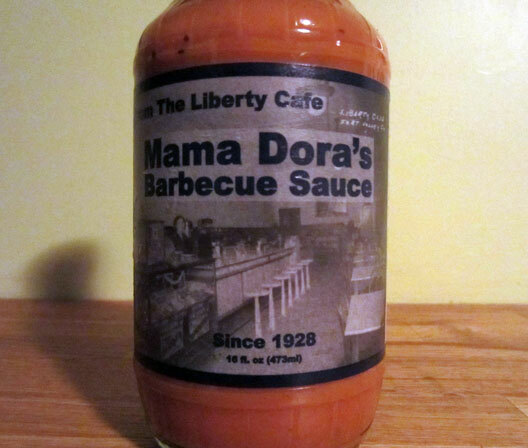 @Joe – I’m going to order this sauce based on your video review. Thanks! I love a good mustard bbq sauce… so, this looks good to me.